SWINGesota is back for their 4th year and we are planning an awesome weekend! It’s going to be a great couple days of learning and social dancing: we will be offering a variety of concept-based workshops to help grow your dance, and giving you a few fun patterns, too. We’ll also have a set of Intermediate and Advanced/All-Star workshops, as well as discounted passes for Advanced/All-Stars and students. And, of course, two awesome nights of dancing and some silly competitions! If you would like to be updated by email, sign up for our mailing list! For a LIMITED TIME, we are offering an earlybird discount coupon! Register before 7/22 and save $20 off of your pass! Valid for full time students! * Intermediate or Adv/All-Star level achieved in West Coast Swing as defined by WSDC. Upon registration, user must identify WSDC # for verification. ** Does not apply to Intermediate or Adv/All-Star workshops. Intermediate and Adv/All-Star workshops are ONLY available with full weekend passes. Ruby is a nationally renowned DJ from the Houston, TX area. She began DJing in 2008 and has since been awarded the title of DJ of the Year by the Allswing DJ Group and is part of the DJ Hall of Fame from the Global Swing DJs Group. She spends countless hours seeking out the best new music to share with the West Coast Swing community and loves nothing more than packing a dance floor and keeping people dancing. This is a tentative workshop schedule as workshops and locations have yet to be finalized. Check back here for more info! 10:30 - 11:00 Auditions for Int. * Intermediate or Adv/All-Star level achieved in West Coast Swing as defined by WSDC. Here at SWINGesota we like to keep things nice and simple. No formal competitions. No points. We're just having fun and dancing for awesome prizes. Do you like to both lead and follow? Then this competition is for you! You will dance and at the ring of the bell, you switch roles! This competition is for all dancers from Newcomer to Intermediate. Participants will be matched with a random partner, dance to random songs, and compete for a hat! This competition is for our Advanced and All-star competitors. Each couple will get one normal WCS song... and a special Hieu Le challenge song! Our entire dance weekend will be hosted in the Hyatt Regency Hotel ballroom space! We also have a room block with special rates for attendees! Rates are $129/night + tax. 1 lightrail stop from the MSP airport and the Mall of America! Room rates are good until 7/05/2019. Have some thoughts or questions about the event? Use the contact form on the lower right tab of the page or call us at (612) 217-4438. Robert Royston’s professional career began on the competitive couples dance circuit in 1989. Quickly ascending the ranks, Robert successfully secured eight (8) “U.S. 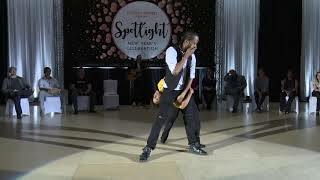 Open Swing Dance Championship titles,” six (6) different “World Country Dance Championship titles,” and two (2) “USA Grand National Championships Titles.” In addition, he holds national titles in Hustle, Salsa, and Cabaret. Inducted into the “California Swing Dance Hall of Fame” in 1999, Robert continued his rise as a dance legend becoming the youngest person inducted to the “UCWDC Country Dance Hall of Fame” in 2007. His inductions into the “World Swing Dance Hall of Fame” and the “Living Legends of Dance Society” in 2011 make him the only dancer ever inducted into all of these organizations. Robert’s exciting, high energy original work gained the attention of producers of the Broadway musical, “Swing!” This led to his appearance for 1-1/2 years in the 7 time Tony nominated musical as a principle dancer performing his own choreography. He later became the assistant choreographer for the first National Tour of the production. Royston’s work was highlighted in the production of “Gypsy of the Year on Broadway” at New York’s Palace Theatre, as well as “Destination Groove”, a Choreographer’s Showcase. His choreography again drew attention in the New York workshop production of “Urban Cowboy,” a production in which he also performed. In 2002, Royston created and produced the critically acclaimed show "SWANGO: The Musical.” The show ran in New York as a cabaret, leading to a full show with performances in NYC. Four-time Tony Award winner, Rupert Holmes, joined the creative team to write the script for the productions. Other stage shows in which Royston performed or choreographed include Neil Bergs’ “100 years of Broadway,” “Uncle Tom’s Cabin,” “Cheer, The Musical” (workshop), “Fashion the Musical,” and the RDC production of “StreetSwing,” as well as Royston’s newest show “One Ride,” which he directed and choreographed to critical acclaim in NYC. Royston’s next journey led him into the music video world as a choreographer. Taylor Swift’s “Love Story,” which was choreographed by Royston, won the 2009 CMA and CMT Videos of the Year. Some other highlights of Royston’s music video career include: Steel Magnolia’s “Last Night Again,” nominee for 2011 CMT Best Video, Gloriana’s “Wanna Take You Home,” The Band Perry’s “Hip To My Heart,” The Mavericks’ “Born to be Blue,” The Bellamy Brothers’ “Shine Them Buckles,” and Roger Brown’s “Swing City.” Following the success of “Love Story,” Royston choreographed Taylor Swift’s sold out, record breaking 2009 “Fearless” Tour. Subsequent to “Fearless” Royston’s career as a sought after performance coach, live tour director, and choreographer has skyrocketed. His latest tour work involved the staging of Carly Rae Jepsen’s 2013 “This Kiss” tour. Robert’s staging for award shows includes artists: Brad Paisley, Carrie Underwood, Sugarland, Miranda Lambert, John Fogerty, Brooks and Dunn, Rascal Flatts, and Charlie Daniels. Royston also stays busy working with new artists like The Band Perry, Katie Armiger, Hudson Moore, Steel Magnolia, Madison Cain, Eden’s Edge, Greg Bates, Laura Bell Bundy, and many others. Presently, many artists are touring whose live performances Royston has directed, coached, or choreographed. In 2013, his choreography was again highlighted during the “Dance Y’all” presentation in Rascal Flatts’ World Tour. Royston worked as the producer and choreographer of the feature film, "Love n’ Dancing" (starring Amy Smart, Billy Zane). Lakeshore Entertainment’s two feature films, “Gamer” (starring Gerard Butler and Michael C. Hall) and “Crank 2 High Voltage” (Starring Jason Statham and Amy Smart) were choreographed by Royston, as well as the unreleased 2014 Disney Film “Million Dollar Arm” (Starring Jon Hamm). Additional credits include: Choreography for the 2008 CMA Awards show on ABC, the 2009 and 2010 ACM Awards shows on CBS, and the 2010 ACA Awards show on Fox. Additionally, Royston works with 7-time British Ice Dance Champions and Olympians, The Kerrs, as well as current British Ice Dance Champions Penny Coomes and Nick Buckland who Royston coached through the 2014 Olympics. Appearances on TV include: E! Networks 2012 season of “Opening Act” as a performance coach, 2010 season of CMT’s Next Superstar as a Judge and mentor, The Today Show, The Rosie O'Donnell Show, The View, The Macy's Thanksgiving Day Parade in 1999 and 2000, and the 2000 Tony awards. He also created and produced the World Championships of Country Dance on GAC Network. Lastly, Royston is an internationally recognized MC. Having been the Voice of the US Open for 10 years, he created the Social Networking “Shout Out” for Viewers online, making the world feel part of the event! At the USA Grand Nationals his MC work has twice earned him the People’s Choice Award “Entertainer of the Year”. With his current schedule Royston acts as emcee at over 18 events worldwide. Royston received his Bachelor Degree of Dance in 2005 and remains a longstanding member of the International Association of Dance Medicine and Science, and achieved a Professional Dance Instructor Association Master certification. Royston also teaches his Intensives on Dance Physics all over the world in addition to judging and teaching 27 different styles of couples dancing while also running his own Production Company, RoRo Productions in NYC. Above all, he is most proud of his children and feels being a Dad is his greatest journey. Both John and Alyssa compete on the Swing Circuit in the Champions division. Together they have traveled around North America, Europe, Asia and New Zealand spreading their personal love for Swing. Their partnership emphasizes musicality and connection. 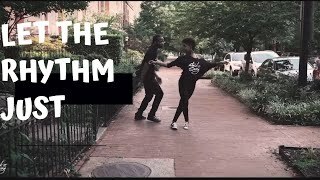 Morphing basic patterns to add shape and dimension to movement with your partner. Develop fundamental techniques for proper WCS connection and movement. Students will find ways to add more groove and funk to their dance through the use of body isolations. Students will learn syncopated footwork variations to add within their basic moves. Understanding the volume control of energy levels within patterns and partnering. Find moments to build and create outside of your basic patterns. Learn a variety of exercises to help grow your dance.